While fixed bridges and removable prostheses used to be the main options to replace missing teeth, modern implant dentistry has evolved and can now be used to fill in missing tooth space without making changes to any adjacent teeth. If you're considering dental implants in Cedar Park or the sorrounding neighborhoods of Twin Creeks, Deer Creek Ranch, Steiner Ranch, or Northwest Austin, read through this dental implant information and contact Gallop Family Dentistry if you would like to request an appointment for a dental implant consultation. Dr. Gallop will determine whether your implant(s) would best be placed by an oral and maxillofacial surgeon or by a periodontist, both dental specialists very experienced with implant evaluation, planning, and placement. The fee for tooth replacement with dental implants depends on several factors, including the number of teeth being replaced and the number of dental implants required to support your replacement teeth. Some additional procedures may be required prior to the placement of your dental implants to ensure the long-term health of your dental implants. To obtain a specific fee estimate, it is necessary to have a doctor examine your mouth. After a thorough diagnostic examination, Dr. Gallop will recommend the treatment that is best for you. The conventional process can take from three to six months. First, the dental implant dentist places the dental implant, which is left for three to six months to heal and integrate with the jawbone. 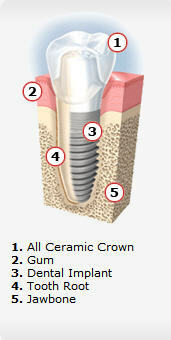 During the healing period, your are given a temporary prosthesis until the permanent crown is put in place. Your new teeth must be cared for and checked regularly, just like your natural teeth. Brush and floss as recommended by your Cedar Park dental implant dentist or dental hygienist. See your dentist in six months, or more frequently if so advised.